In “Summer flowers”, we see a spray of beautiful fresh flowers, bathed in the bright morning sunlight. The colors are so well balanced, yet so vibrant, all that’s missing is the fragrant scents from the blossoms. With the neutral olive background, the rich colors of deep reds, lilacs, yellows, and light blues are highlighted to absolutely brilliant effect. Full of lush detail in each flower, this tapestry will gives a sense of serenity and beauty to your home. 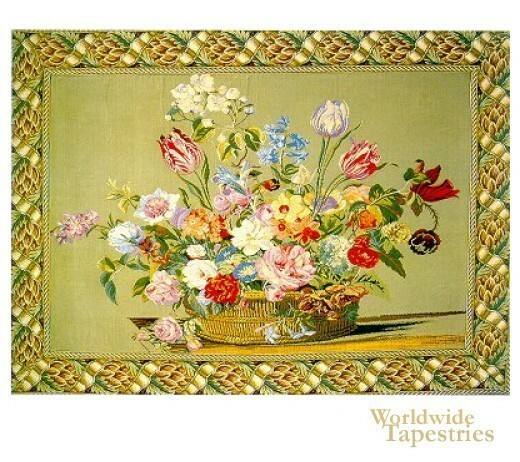 This tapestry “Summer flowers” is lined and has a tunnel for easy hanging.